The original Griffith bonnet stay had one virtue, it was very light but that is about its only good feature. Having tolerated its shortcomings for several years including: Bending, not supporting the bonnet adequately and getting in the way while doing basic maintenance I finally lost patience after a run when it released itself from the inner wing and lodged against the swirl pot overflow pipe effectively blocking the pipe completely. Several different designs have evolved over the years as owners have become frustrated with the shortcomings of the original. David Beer produced a telescopic version, Steve Heath produced a side mounted one using a rose joint and more recently Leven Technology have produced their own design. I decided to have a go at cobbling something together. If the cross piece is rigid then a side mounted stay is both out of the way for basic maintenance and will be more stable than the original. Having access to a lathe and a millling machine enabled some simple parts to be machined. 10mm stainless steel tube is a lot more substantial than the original flimsy aluminium so was chosen both for the cross piece and the support stay. 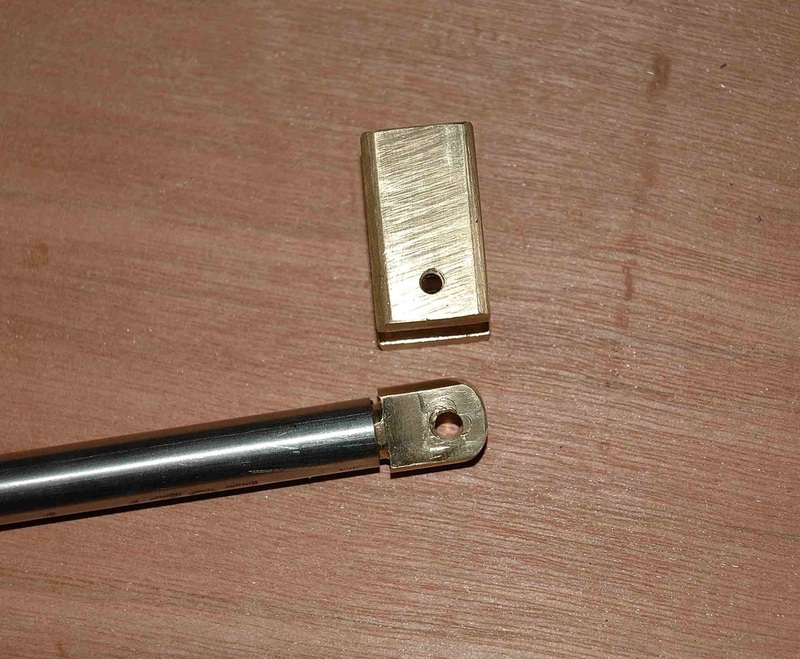 A couple of brass end plugs for the cross piece were turned on the lathe to be an interference fit and secured with Loctite 648. The plugs were tapped M6 1.0mm to match the existing bolts that also secure the bonnet rollers. A universal joint was fabricated from brass that allowed the new stay (also 10mm stainless tube) to pivot from the cross piece in two directions. To locate the support stay on the inner wing bracket some mild steel rod was turned to again be an interference fit in the support tube. 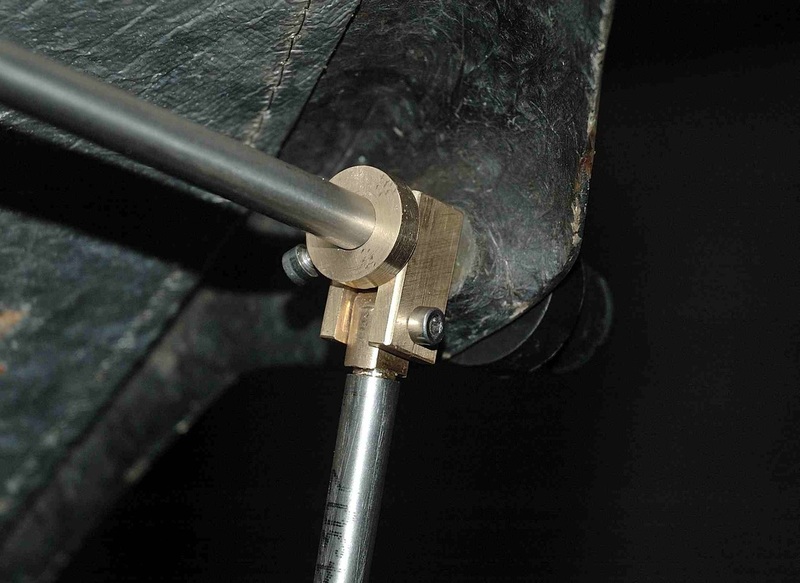 Mild steel was chosen as magnets in the holding piece are used to store the support stay when not in use. The holding piece is shown top left in the third picture above with two small circular Neodymium magnets bolted to the inside. It is shown holding the stay below. Initially I tried to use simple Terry clips to secure the stay in the parked position but it just rattled loose when driven so decided to try the magnets. The universal joint is seen bolted to the nearside of the bonnet. The locking ring stops the joint from moving inward but can also be used to position the stay more centrally if desired. The stay is shown located on the wing bracket. 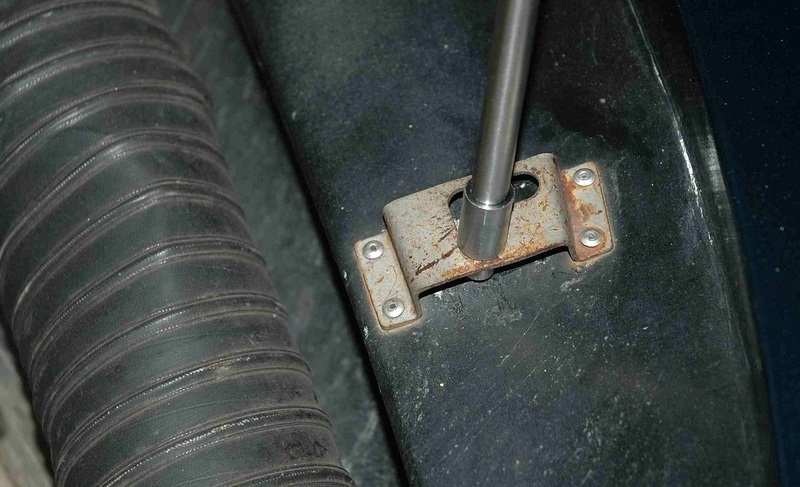 The pictures below show the stay in the stored position where it is much more secure than the original aluminium stay that frequently used to fall down onto the engine. Unfortunately I had overlooked the vast amount of heat generated under the Griffith bonnet, this heat was sufficient to de-magnetise the Neodymium magnets albeit temporarily. As a fix I discarded the magnet idea and fashioned a keep out of Delrin seen above in the right picture. This seemed to cope well with the under bonnet heat but as belt and braces I also introduced a locking pin as shown.